I’ve finally got my act together. I’ve sulked long enough, and I think I figured out a solution. I think I can make this sweater work. I’ll live to knit another day. But first, I had to rip an entire sleeve. It was… an unfortunate amount of ripping. I poured myself a nice stiff drink and went to town. God… look how different that yarn is. (New yarn is on the right, old, scraggly yarn is on the left.) I remembered someone telling me, or maybe reading somewhere (not sure where… I just know I didn’t make this up), that if you had two different dye lots that you had to make work, you can work them in stripes to blend the two colors together. It was worth a shot. 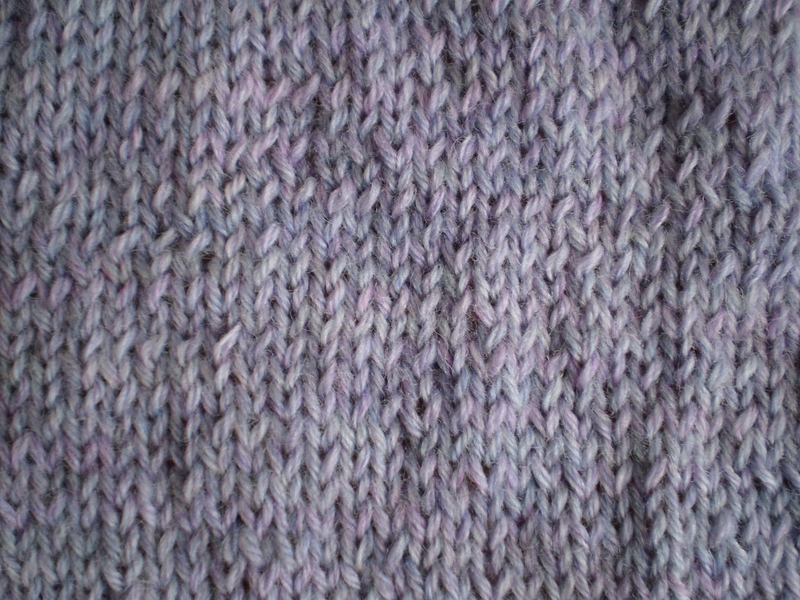 But, when I tried narrow, 1-row stripes, I managed to get a pretty even color. And, since I’m using a big circular needle, I can slide the needle back and forth after every other row. That means I don’t have to break my yarn or juggle extra balls of yarn! Winning! See? 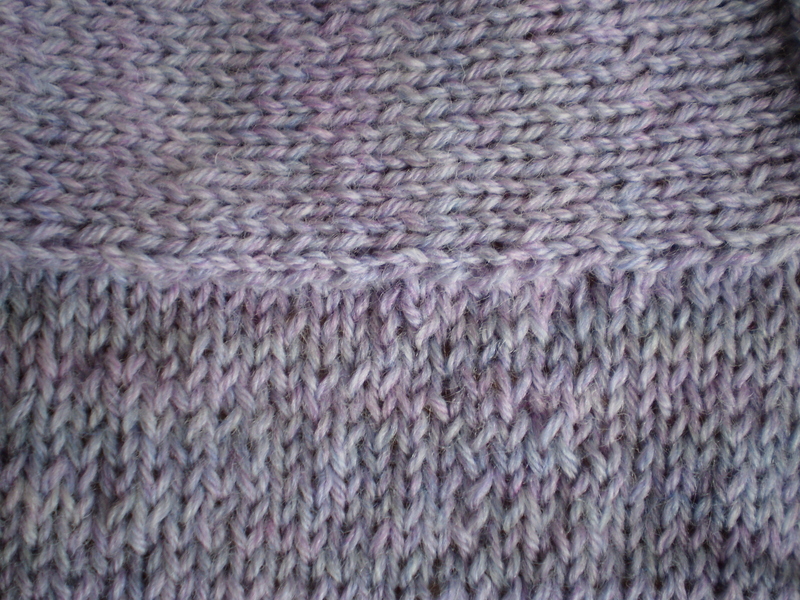 The sleeve (the bottom portion of the picture) is pretty close to the rest of the sweater. It’s still a smidge blue-ish in real life, but only so much that someone looking really closely would notice it. The only problem is that the combination of new yarn and old, frogged yarn makes the fabric a bit of a mess. But at this point, I’m just going to cross my fingers and hope that it looks OK after blocking. Have you ever had to get creative to get around poor dye-lot matching? This entry was posted in FYI and tagged blending, color, dye lot, dye lots, knitting, sleeve, stranger cardigan, sweater, yarn on July 11, 2016 by onemilljellybeans. I’m completely heartbroken. My hopes have been dashed. My best plans of a simple, fun, and easy sweater are completely falling apart. 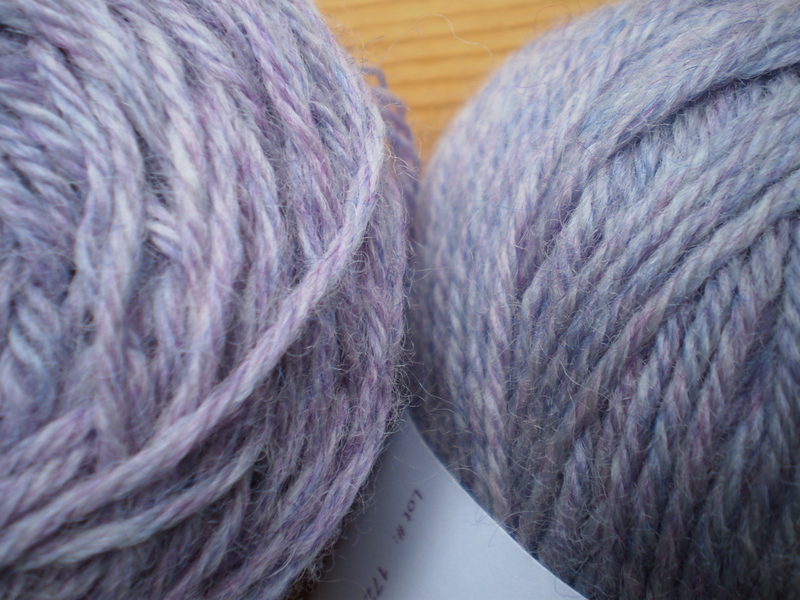 The ball of yarn on the left is the new yarn- it’s significantly more blue-gray. 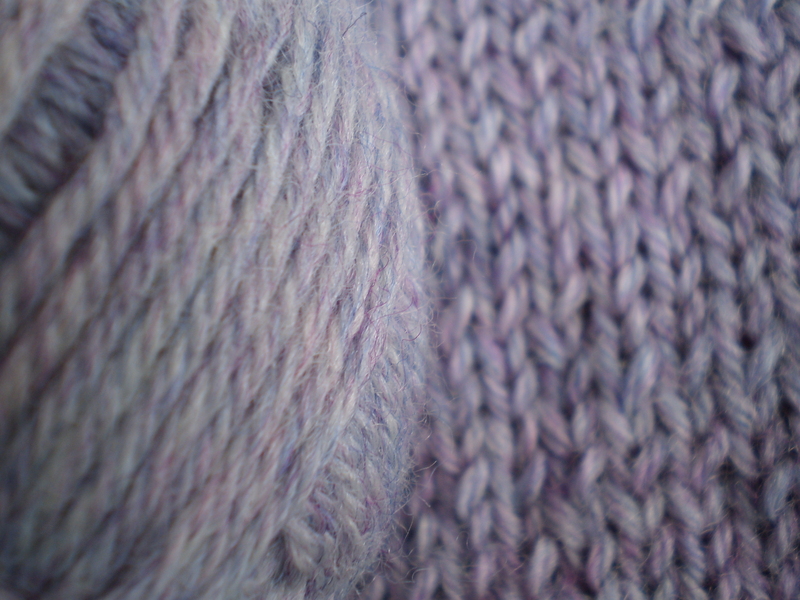 And the half-finished sweater is on the right- it’s a lovely pink-y lavender. I know they look pretty similar in these photos (it’s been established my photography skills are lacking), but in real life, they’re significantly different. Even my husband commented. I’ve got the whole sweater finished with the old yarn, except for the left sleeve. I can’t have a sweater with one different color arm! This, boys and girls, is why you buy all your yarn at once. Now I’m going to go drink a lot of coffee and come up with a plan. This entry was posted in On My Needles and tagged cable sweater, color, dye lot, dye lots, knitting, stranger cardigan, yarn on July 6, 2016 by onemilljellybeans. I actually bought these three nano-skeins as a single mini skein. They were the ends of a couple different batches (aka. dye lots) of yarn, supposedly dyed the same way. See how the one on the right is more olive-y? See how the left one is greener? And the one in the middle has a lot more blue in it? When you buy hand-dyed yarn, you have to expect there will be a bit of variation in dye pattern between dye lots. 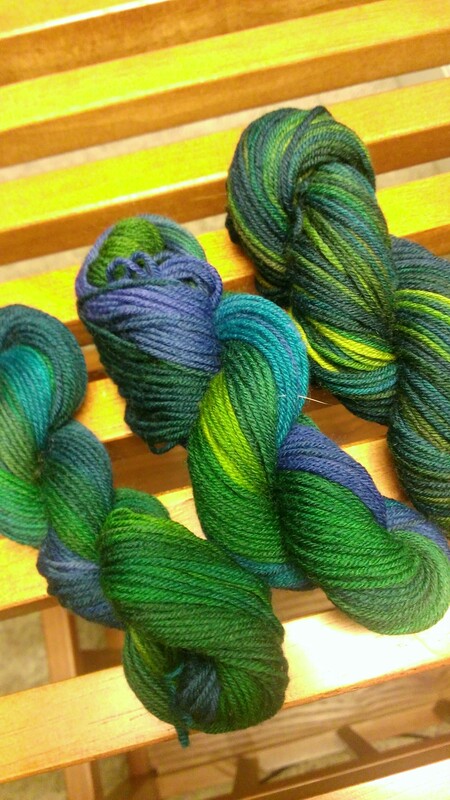 (Even mass-produced yarn has some variation between dye lots.) Sometimes it’s subtle, but sometimes it’s super obvious. Option 1: Buy all your yarn from the same dye lot. Look on the label, and you’ll see information about the color. 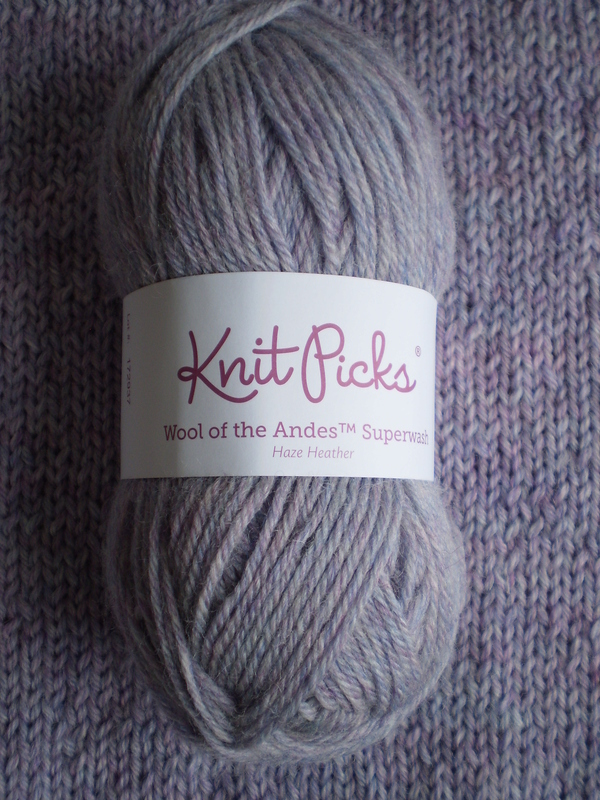 The colorway (the color the yarn is supposed to be) will be indicated. Usually the colorway has a descriptive name (like Heather Gray, or Sunshine Yellow, or whatever), but sometimes it’s a serial number. It depends on the company. The dye lot will be indicated by a number. It’ll be written “Lot:###” or “Dye Lot:###.” Usually yarn stores will stock mostly one dye lot at a time, but check anyway, just to be sure. Stripes. Lots of stripes. If you mix your yarn together (changing the yarn you work with every row or two), changes between the dye lots will blend together and become unnoticeable. If you’re working in the round, think about using my spiral technique from Friday. This option takes approximately another metric ton of extra work, but if you’re talking about the difference between making a sweater that you will wear for the next ten years, or a sweater you’ll leave sitting in the bottom of your closet, it might be worth it. Just sayin’. This entry was posted in FYI and tagged blending, blending colors, colorway, dye, dye lot, yarn on September 9, 2013 by onemilljellybeans.